If a company can't compete in the digital space, it's doomed. This has been my investment thesis over the past several years. And it seems to be the case once again this earnings season. Walmart (NYSE: WMT) shares tumbled more than 10% as its digital sales growth weakened. Target (NYSE: TGT) shares dropped 4.5% as its profits slipped. Shares of ailing department store J.C. Penney (NYSE: JCP) fell 5.4% as it was once again forced to slash jobs. And mall-based retailers posted holiday results that left me less than optimistic. Meanwhile, shares of discount retailer Dollar Tree (Nasdaq: DLTR) sank more than 14.5% on an ugly fourth quarter. I do give J.C. Penney and Sears Holdings (Nasdaq: SHLD) credit for still existing because they're suffering a long, drawn out, slow and painful death... Shares of both are down more than 80% over the past five years. I know, some investors are never going to let go of these cherished jewels of a bygone era. But Sears is now essentially a microcap stock. So far this year, we've seen digital retailers outperforming brick-and-mortars by a wide margin once again. The Amplify Online Retail ETF is focused solely on internet retailers. 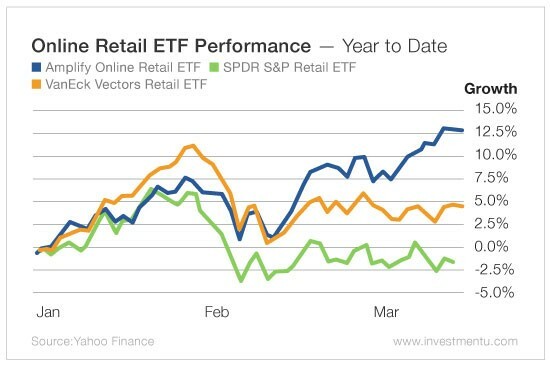 It's more than doubled the performance of the VanEck Vectors Retail ETF, while the SPDR S&P Retail ETF has struggled to keep its head above water. 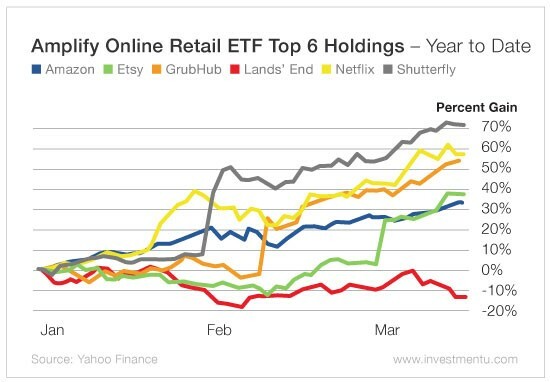 Amplify Online Retail ETF's largest holdings are diverse: Amazon (Nasdaq: AMZN), Etsy (Nasdaq: ETSY), GrubHub (NYSE: GRUB), Lands' End (Nasdaq: LE), Netflix (Nasdaq: NFLX) and Shutterfly (Nasdaq: SFLY). More importantly, instead of tanking on earnings, Etsy, GrubHub and Shutterfly soared more than 20% each in a single day on fantastic holiday season reports. Of those largest holdings, only Lands' End struggled. Skeptical investors may look at VanEck Vectors Retail ETF in the first chart and see that it's up more than 4% year to date. Since it mostly holds retailers with physical stores, doesn't that mean there's a bunch of tremendous brick-and-mortar stories? Well, not so fast... Amazon makes up 25% of the ETF. That's right... VanEck Vectors Retail ETF holds 26 positions. Yet one-quarter of it is weighted in a single company. For comparison, Amplify Online Retail ETF holds 42 positions, with Amazon accounting for just 3.7% of its weight. I'll often hear the argument that online retail makes up only a small portion of total retail. But that doesn't substantiate an argument against online retail. In fact, it proves my thesis about how much room e-commerce stocks have to run. Look at it this way... In 2000, U.S. online annual retail sales were $27.5 billion. That seemed like a lot. But between 2000 and the end of 2017, online sales grew 1,649% to $453.5 billion. And that's just in the U.S., which isn't even close to being the largest online retail market in the world - China owns that label by a long shot. In 2017, global e-commerce sales grew 23% to more than $2 trillion... and yet online sales represented only one-tenth of total retail sales worldwide. By 2021, global e-commerce sales will double to $4.5 trillion. We're arguably still in the early stages. This is something that's started to take off only in the last decade. There's still massive upside ahead... especially as the younger generations adopt online retail as the norm. "Is retail dead?" is becoming the "Who shot J.R.?" question of this decade. 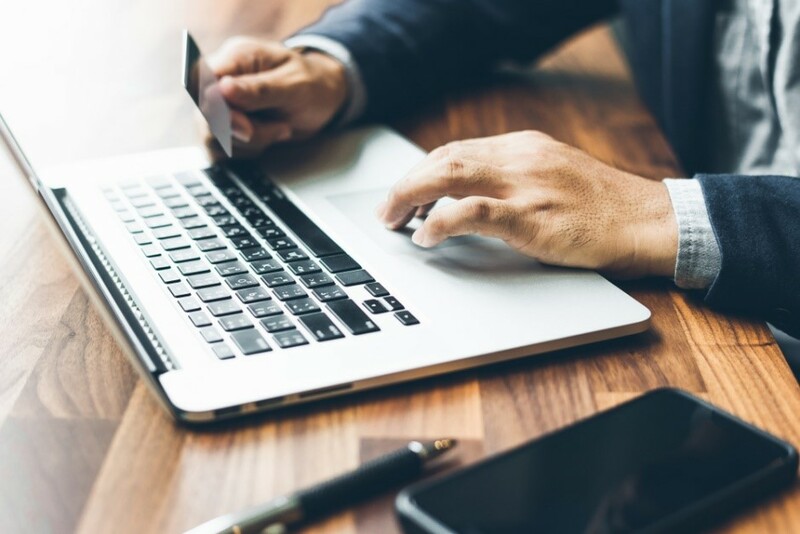 While there's plenty of speculation and opinion on both sides, it's clear that online retail has plenty of room for future growth. On February 8, before the bell, we had several exciting news items from GrubHub (NYSE: GRUB). It's important to remember that GrubHub is more than just a food delivery service company. It's also involved in my two favorite areas of tech - robotics and autonomous vehicles. And these areas are seen as a great emerging opportunity for the food delivery industry. In fact, robots already deliver meals in San Francisco. But larger food chains are beginning to understand the potential that GrubHub offers. Yum Brands (NYSE: YUM), the owner of KFC, Pizza Hut and Taco Bell, announced it purchased $200 million worth of GrubHub shares. Yum Brands is looking to expand its online ordering and delivery business for its restaurants and sees GrubHub as a perfect fit. This was a major announcement in and of itself... but that wasn't all. GrubHub then released fourth quarter earnings. Expectations were $201.7 million in revenue with earnings per share (EPS) of $0.31. The company came in with $205.1 million in revenue with EPS of $0.37. On the revenue side, this was an increase of 49%. And EPS rose 60%. For the first quarter, GrubHub is forecasting revenue between $224 million and $232 million. The midpoint tops the $226.7 million analysts were looking for. Our shares of GrubHub are soaring - up more than 58% - and setting new 52-week highs.